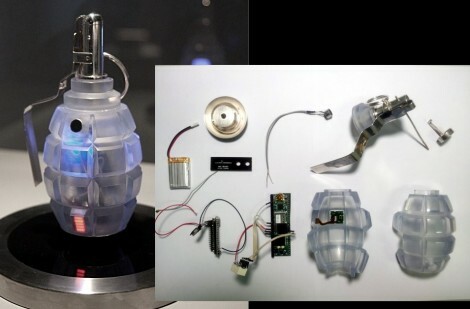 If you’re tired of underhanded deals going down behind closed doors maybe you need to start carrying around this transparency grenade. The enclosure is modeled after a Soviet-era F1 Hand Grenade. But it’s not filled with explosives and won’t send deadly shrapnel around the room. Instead, when the pin is pulled it starts recording audio and sniffing network packets, then broadcasts both to a remote server. Perhaps you could consider this to be data shrapnel sent around the world. The exploded parts image above shows what hardware is at use. There’s a Gumstix board at the heart of the device which uses a WiFi module for sniffing and broadcasting data. The LED bar graph which you see in the fully assembled unit shows the wireless signal strength. It sounds like the enclosure itself was 3D printed from Tusk2700T translucent resin but we’re a little confused by this part of the hardware description. We don’t have much of a need to transmit recordings of our meetings, but we’d love to use this case design for that MP3 enclosure. What about the description of the shell is confusing? The shell was clearly made using Stereo-lithography and Tusk2700T was the photo polymer resin that was used in the SLA. I think this goes without saying, but please – FTLOG, don’t try to take this on a plane with you! Awesome looking project, nicely put together. Considering the hak5 crew had trouble taking a plastic pineapple with a fon in it on a plane, i can only imagine what would happen if you tried to bring this on. An interesting exercise/project, but use is limited to where where groups desire to practice transparency. As for stealth transparency this isn’t it, even if some one wanted to risk the ramifications off stealth transparency. Not much info in that article. What’s the small LCD used for? What’s sampling the microphone? Perhaps its broacasting ads. Whatever “broacasting” is. If anyone is wondering, from the 404, the directory has been changed from “/map” to “/data”.